Thousands of people change their name every year and we make it cheap, easy and quick. 200 thousand people in the UK change their names every year, for a variety of reasons and most consumers simply pay too much for their deed poll to be prepared, either by high street solicitors or online deed poll companies. 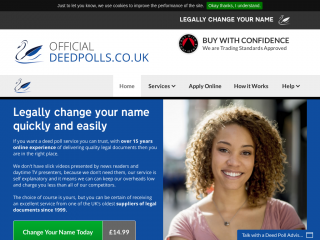 Official DeedPolls makes the process of changing your name, cheaper, quicker and with less hassle than ever before. Using proprietory technology, we have simplified the process, making it ideal for the online consumer to quickly and simply change their name officially on all official documents such as passports, DVLA, Council Tax, Welfare benefits etc. With over 200,000 people estimated to have changed their names by deed poll in 2017, this is a big niche market. With our easy 3 step ordering process customers can order their legal change of name deed in seconds with next day delivery assured. We have 15 years experience of delivering low cost legal services, online,and are providing the best deed poll service in the UK by far.